7-9 rue du Conservatoire, 75009, Paris. Coming into the lobby of Hôtel de Nell is a most welcoming experience. At the door there is an entrance rug that has ‘Charm and More’ printed on it and at first glance, you know that you have stepped into a hotel of supreme charm. The lobby is small with a designer, see -through fire-place which offers a view of a inviting fire in the internal lobby of the hotel. To the right, leading off from the foyer, is a most charming reception area. Atmospherically lit and with a low desk in a small private lounge, with a large bowl of welcoming A la mèrede famille gourmet sweets, it gives the immediate impression of bespoke service. 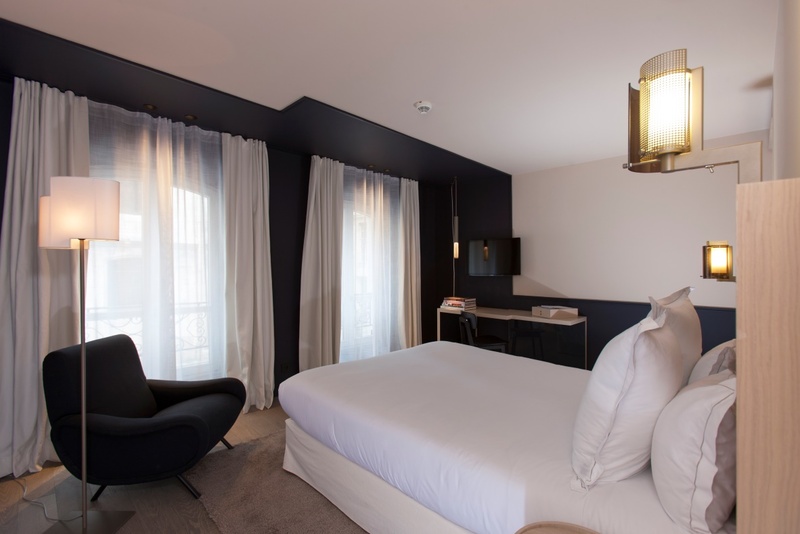 Hôtel de Nell is situated in the 9th arrondissement which is one of the smallest but liveliest districts of the capital and is nestled between Montmartre and the garden of the Palais Royal. At the corner of rue Sainte-Cécile and rue du Conservatoire, Hôtel de Nell faces a centuries-old church and the former Comptoir National d’Escompte with its classically Parisian dome. Hôtel de Nell is perfectly situated to walk and explore many of the must-see sights in Paris and the Louvre is merely a 15-minute walk away. 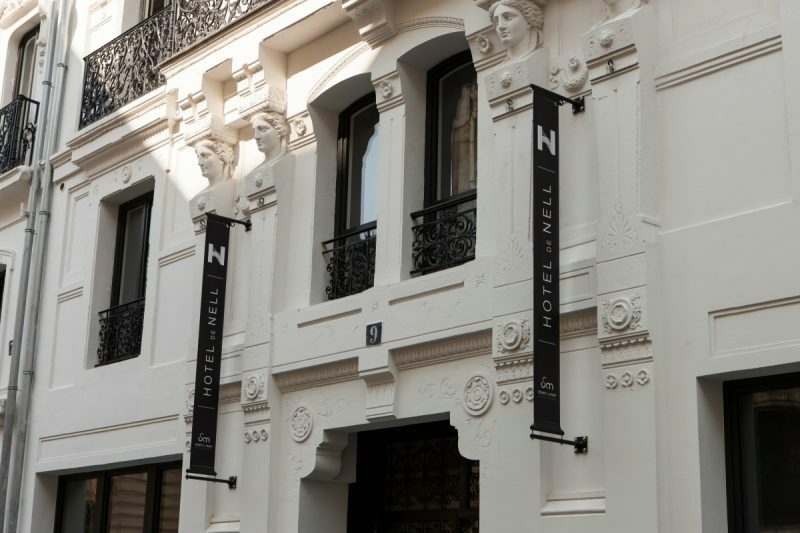 Hôtel de Nell is the third establishment of the ‘Charm and More’ hotel company which was founded in 2003 by Jacques Konckier and his daughter Lisa Konckier-Abrat. Both father and daughter are contemporary art enthusiasts and have extensive experience in the area of bespoke services, perfumes and ready-to-wear clothing. The creative duo dreamed of creating an entirely new kind of hotel where everything would be meticulously designed on a human scale, whilst still allowing guests to enjoy all the services a luxury hotel has to offer. 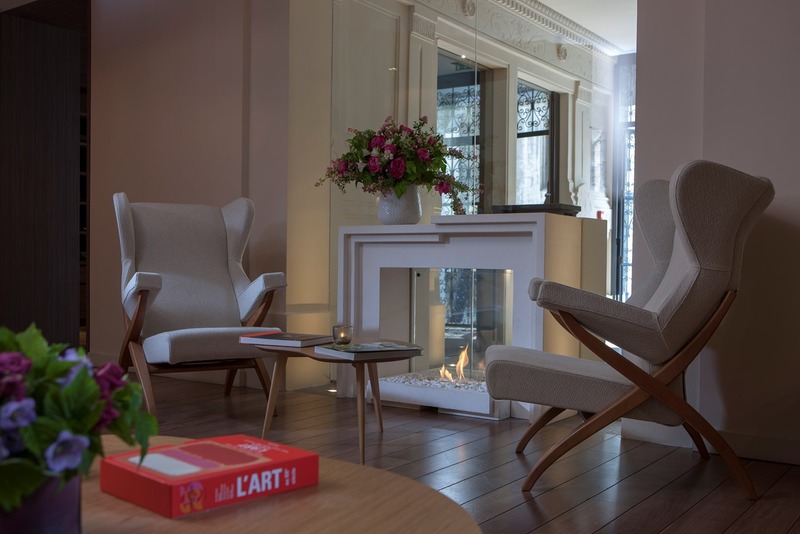 They were the first in Paris to apply the boutique-hotel spirit to a residential hotel with the grand opening of Hôtel de Nell in March 2012. Interior designer, Jean-Michel Wilmotte who is renowned for the clean lines and warm materials he brings to his creations, was commissioned to design the interior of Hôtel de Nell. The custom-made furniture with recessed lines, Artemide lighting and Japanese Baths which are each cut from a solid block of marble, lend an aura of exclusivity to the rooms as does the richness and variety of textures which range from warm panelling, raw marble and thick carpeting. The overall impression creates a clean, cosy atmosphere of well-being and comfort with a definite suggestion of understated sophistication. The conciergerie is open and available at the push of a button or the nod of a head 24 hours a day. The service is impeccable and guests are pampered with a multitude of luxuries. There is a pillow menu which provides pillows à la carte – to honour every whim from soft or firm, carbon-fibre, goose down for softness or a deluxe four-feather pillow. There is also a turn-down service, which surprised this unknowing guest, as I thought I had re-entered the wrong room – jackets which had been left by me in disarray were neatly hanging in the cupboard, curtains were drawn and a small box containing two gourmet chocolates were left on the pillow with their wonderful aroma permeating the room. Other services include an in-room massage , an in-room hairdresser, fitness coaching, babysitting service, chauffeur service, daily housekeeping service and a monitored parking garage. Hôtel de Nell has 33 rooms, two of which are specially equipped for disabled guests. The rooms are all equipped with 32-inch flat-screen televisions, a vast dressing room with illuminated mirrors, iPod and iPhone docks and free WiFi. The bathrooms are created for relaxation and rejuvenation with eco friendly products, discreet underfloor heating, anti-fog mirrors and even provide candles and matches to enhance your bathing experience in the exquisite setting of raw marble and unvarnished Myrtlewood. There is also a fully stocked bar containing everything from artisan lemonade to Champagne and a wonderful selection of Nescafé cartridges for the Nespresso coffee machine. La Regalade Conservatoire is a restaurant with warmth and personality. In keeping with the Charm and More spirit, the clear choice for the restaurant would be simplicity, quality and a friendly atmosphere – in short: Bistronomy. Hôtel de Nell turned to Bruno Doucet, described as ‘master bistronomist’ in foodie circles, to run the restaurant which he does with flair. Bruno says that his chef’s truth boils down to two things: ‘in season ingredients that I enjoy waiting for and then rediscovering, and precise, learned, repeated techniques that transform them.’ The menu holds delights such as home-made terrines, large flash-cooked Provençal porcini mushrooms in season and roast scallops with herb butter. Prices are immutable at €35 which is in short, haute cuisine at bistro prices. €350 to €1200 during the trade-show season; sliding scale seasonal rates. Email: www.hoteldenell.com. Telephone – +33 1.44.83.83.60.